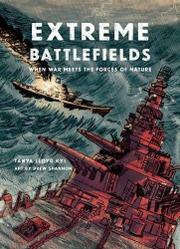 Ten tales of wartime peril and heroism during huge storms, amid trackless mountains, and in the face of other natural barriers and disasters. Kyi leads off with “Hannibal vs. the Alps” and closes with “Allied Forces vs. the Tora Bora Caves” in Afghanistan in 2001. In between, she chronicles ordeals including Napoleon’s bitter retreat through the Russian winter, a World War II task force’s encounter with Typhoon Cobra, the 1822 battle on the slopes of a volcano that freed Quito from Spanish rule, and a still-ongoing standoff between India and Pakistan for control of the wildly inhospitable Siachen Glacier. Though the author arranges her chapters in no particular order and drifts from her premise in one that pits the U.S. Army’s “tunnel rats” against Viet Cong in the man-made Cù Chi tunnels, she tells a tale that is both coherent and laced with vivid observations and details. Also, an overdesigned layout that features abrupt changes of background color, wedged-in sidebars, smudgy decorative elements, and an uneasy mix of period images with modern photos and melodramatic new illustrations in diverse styles is more distraction than enhancement. Still, the basic material is solid enough to keep readers absorbed.